With its discrete and attractive design the Plug-in is recommended for use in domestic and professional environments. Using a UK 230v mains socket, no batteries are required. The Plug-in uses a powerful ultraviolet lamp which attracts flying insects. On the inside of the unit a glueboard is placed on which the insects are trapped. This glueboard is placed out of sight providing discrete control of the flying insect pests. Useful as a night light. The Plug-in is easy to install, easy to service and safe to use. The Arc 4000, unlike many other budget priced machines, uses a 4000 volt high voltage grid to exterminate flying insects. They are suitable for restaurants, kitchens, food shops etc. where flying insects pose a problem. After the insects have been attracted by the high output UVA lamps, and killed by the high voltage grid, they can be quickly and hygienically disposed of in the large catchment tray. Made for wall mounting, suspending or free standing. With its discrete and attractive design the Protect-a-lite 8 is recommended for use in domestic and professional environments. The Protect-a-lite 8 is designed to be placed as either a freestanding or wall-mounted unit. The Protect-a-lite 8 uses a powerful ultraviolet lamp which attracts flying insects. On the inside of the unit a glueboard is placed on which the insects are trapped. This glueboard is placed out of sight providing discrete control of the flying insect pests. Protect-a-lite 8 is easy to install, easy to service and safe to use. Protection is IP20. The unit is designed for indoor use only. The Fly-Shield Solo has been specifically designed for discreet, stylish and effective insect control and is ideally suited not only for domestic use, but also for restaurants, reception areas, coffee shops or sandwich bars, to name but a few. The main body of the Solo is made from corrosion resistant, anodised aluminium, which not only means it is simple to keep clean but also makes it light and easily portable, if so desired. The Compact range brings with it many of the benefits usually found on more expensive machines. This range has been designed, developed and produced by the Insect-a-clear team in the UK. The Nano G20 is a professional UK manufactured glue board insect control machine suitable for smaller restaurants, kitchens, food shops etc. where flying insects pose a problem. The large glue board and the specially developed 20 watt lamp ensures good coverage. The Insect-a-clear FLY-SHIELD range comprises three models, the FLY-SHIELD 1, 2 and 4. It is the ideal alternative to conventional high voltage machines. Models 1 and 2 are suitable for front of house flying insect control where discreet management is required. Model 4 is suitable for larger areas where suspending the machine gives a massive 360 sq metre approx. coverage. 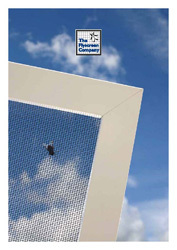 The Insect-a-clear WALL-FLY has been designed for areas such as restaurants, receptions, coffee shops or sandwich bars – in fact anywhere where discreet, stylish insect control is required. Smooth curvaceous lines replace the harsh square corners of old. It is fitted with an 18w energy saving lamp and large unobstructed glue board. Every WALL-FLY chassis is constructed of bright annealed stainless steel with an option of powder coated white or grained finished stainless steel. The Insect-a-clear COMPACT CIRCLINE is ideal where ceiling height or wall space is restricted and can be wall mounted, suspended or free standing. The outer casings are made from steel which is then powder coated white. The FLY-CHECK is a wall mounted or suspended economically priced fly killer that uses 2 of the popular 15 watt x 18" lamps. Changing the adhesive board and lamps is very quick and easy. Its slim design makes it suitable for areas where room is at a premium, i.e. food preparation areas, kitchens etc. This addition to the Insect-a-clear range is the most technologically advanced to date! Fully electronic, it ensures minimal power consumption, meaning maximum financial savings, when compared to similar conventional units. The curvaceous, contemporary design and the stainless steel front-guard, together have produced a terrific machine. It is ideal for virtually any application (front of house or behind the scenes). An IP65 version is also available. All machines are fitted with high output Quantum lamps. For use in restaurants, food shops, kitchen areas, fast food outlets etc., indeed anywhere where flying insects present a problem. All models are ideal where ceiling height or wall space is restricted and all models can be wall mounted, suspended or free standing. Outer casings for all models are made from steel which is then powder coated white.